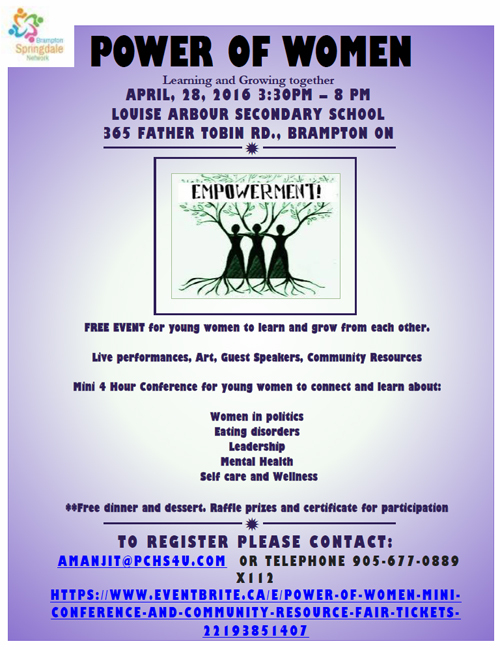 Power of Women Mini-Conference, Apr 28th 3:30-8pm. Louise Arbour Secondary School, 365 Father Tobin Road, Brampton. according to Beth Savan, Ph.D. MCIP Senior Lecturer Emeritus, School of the Environment, and Research Associate, Cities Centre with the University of Toronto; Senior Fellow, Massey College. Professor Savan reported that 2/3 of cycling trips are taken by men, but when cycling density is higher, the cycling rate of women rises to 50%. For that reason, BikeBrampton wants to reduce the barriers to cycling, promote the power of women and open up the possibilities for young women riding for fun, to school, to work and for errands. If you are a young woman or know someone who is, here is the free registration link.